For many in relationships, Valentine’s Day has become yet another over-commercialized, pressure-filled relationship moment. You have to find the perfect card, give the perfect gift, and plan the perfect date. If not, then you’re failing to properly demonstrate your love. Those who are single often feel left out on Valentine’s Day. For those with children, the “holiday” often feels like a chore, where you have to nag your kids to make cards for every classmate—as well as their teachers. 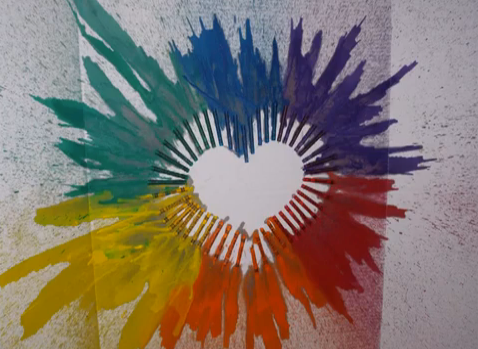 If you’re really creative, you might scan Pinterest or YouTube to get instructions on how to make melted-crayon hearts or Valentines for every one of your child’s classmates. Wouldn’t it be nice if we all agreed to just pare down Valentine’s Day to its core? Why don’t we just view it as a sanctioned opportunity to tell those around us how much we love them? You don’t have to shell out a whole lot of money or spend an evening baking crayons in heart-shaped cupcake tins. Let’s shift the focus of Valentine’s Day from jewelry, flowers, and candy to a day centered on showing our love in meaningful and thoughtful ways. Then, let’s extend it so that we show our love throughout the year—not just on one day in February. Find an old deck of cards and make a little book of specific reasons why you love someone. This is a perfect gift for anyone: a significant other, child, parent, or friend. Unless your first date was an absolute disaster, a fun gift idea would be to try to recreate that experience. If you saw a movie on your first date, borrow the video and plan a movie night. Did you eat Mexican food? Look up the recipe online, and have a cooking date. For many of us, the winter cold has kept us bundled up inside this year. Why not flout the weather and plan an indoor picnic? For couples, this could be a romantic experience. For kids, this could be pure silliness. Share finger foods and favorite treats, and play card games, board games, or watch the Olympics. Pay close attention to conversations with friends and family. Take note of whether they mention something that would improve their lives. Have they bemoaned the state of their closet? Help them set up an organization system. Are their Christmas lights still up? Offer to help take them down. For many people, taking a nagging task off of their to-do list is one of the sweetest gifts you can give. Has a loved one been wanting to learn a particular skill? If so, see if you can arrange for a few lessons. See if you can save money by bartering with another friend: for example, if your wife has been wanting to learn to play the guitar, ask your guitar-playing friend if she would give lessons in exchange for a week of home-cooked meals. This group Valentine is thoughtful and incredibly simple to pull off. Cut out construction paper hearts, and give them out to each person. 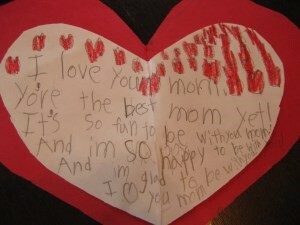 Each person writes down what they love about a family member or friend on the hearts. Younger kids can dictate to older kids or adults. How could you not enjoy receiving a bunch of handmade hearts filled with heart-felt compliments? Did you hear about last year’s campaign to reboot Valentine’s Day into Generosity Day? There are lots of wonderful ways to spread the love in your own community. You can donate old clothes to Goodwill, leave a $5 tip for a $2 coffee, bring in lunch for your co-workers, or give someone a compliment. For a wonderful list of kindness ideas, see here. For more gift ideas, be sure to check out SoKind Registry’s Gift Ideas and Pinterest boards.